1. On a statistics spreadsheet, enter the geometric means from the histogram statistics view for the four beads. 2. Enter the lot specific values for PE molecules per bead from the flyer in the kit. 3. Calculate the log10 for each FL-2 geometric mean and for the PE molecules per bead. 4. 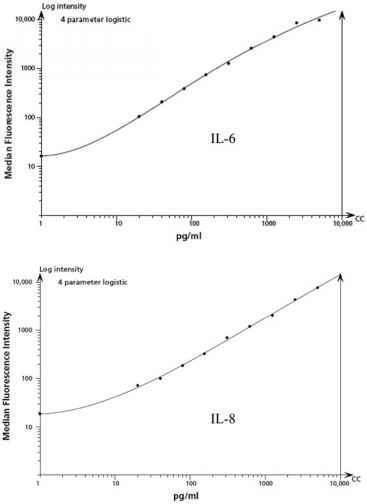 Plot a liner regression of log10 PE molecules per bead against log10 fluorescence using the equation y = mx + c.
5. Determine the ABC values for the PE-stained samples by substituting the log FL2 geometric mean of that population and solving for the log ABC (the antilog of this number is the ABC value).